Why Working at NSWC Dahlgren is the Place to Be! – Zekiah Technologies, Inc.
70% of the workforce at NSWCDD are scientists and engineers and 82% have a four-year degree or higher, with 31% having a master or higher. King George County boasts more Ph.D.’s per capita than the other 94 counties in Virginia so if you want to be among the brightest and most innovative people, King George is the place to be! ccess to more than 73,000 acres of forest land, two state parks (Caledon with 2,579 acres and a bald eagle nesting area and Land End Wildlife Preserve with 430 acres), two local parks, and a public boat landing at Wilmont Landing. There are plenty of opportunities to enjoy the Potomac River as well which is literally in NSWCDD’s backyard. If nature is not your cup of tea, there are shopping opportunities right outside the base gates and we are within an hour from Fredericksburg, VA with its historical sites and shopping as well as Washington, DC and Richmond, VA. The cost of living in King George is very reasonable and is still a safe area providing opportunities for its residents. For example, comparing King George to Alexandria which is just 45 miles away, the cost of living is 14% lower in King George. That means if you are making $100,000 in Alexandria, you can make $14,000 less and still have the same standard of living! Since King George has so many employment opportunities though, it is likely your standard of living would just be higher. One reason the cost of living is so much less is that the average house cost in Alexandria is $589,085 and the average house in King George is only $297,535. I know what you are thinking… with houses that reasonably priced, then the crime rate must be high. Not true! Using our sample city of Alexandria, the number of violent crimes per 100,000 citizens is 176 in Alexandria. King George is only 111! King George County is divided almost evenly into quarters by Routes 3 and 301. These roads are well maintained two-lane highways with significantly less traffic than comparable commuter roads, such as I-95 or Route 1. Getting around King George (and even into the surrounding counties!) is quick and easy. If you are used to driving 10 miles taking you an hour, you will be pleasantly surprised that here it generally will only take you 10 minutes. The climate is great here too. The average snowfall is 16 inches – just enough to have fun but not enough to be annoying. The average summer temperature is 74 degrees and the average winter temperature is 38 degrees. The University of Mary Washington offers both undergraduate and graduate studies and in January 2012, they opened a new campus in Dahlgren. Old Dominion University offers telecourses and distance learning opportunities at the new Dahlgren Campus as well. Strayer University, George Mason University, Virginia Commonwealth University, Virginia Union University and the University of Richmond are within easy commuting distance and offers graduate and post graduate degrees. Rappahannock Community College and Germanna Community College offer continuing education and associate degrees in a variety of programs and disciplines. In addition, both colleges offer workforce development training and programs for existing and new business locating into the county. King George Public Schools has a high ranking with various public ranking systems and a great student to teacher ratio of only 15:1 at the high school. Niche.com ranks their college prep program with a B+. King George High School works with Rappahannock Community College to also provide vocational education. 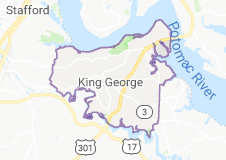 So, if you are looking for a place to live that offers exciting and challenging employment opportunities, quality of life outside the workplace, affordable and safe housing and great educational systems for yourself and your family, King George is the place to be!